Our cover story was generated by an editorial in the Journal of the American Medical Association by several ethicists who view the deinstitutionalization movement of the 1960s and 1970s as a failure of the community mental health system to meet the needs of people with the most severe mental illnesses. Instead, they contend, it has turned into "transinstitutionalization" in which those with severe mental illnesses have been sentenced to jails and prisons, been frequent visitors in emergency departments, and become victims of violence and abuse. They argue that the only way they can receive humane care is in the structured setting of an institution, an "asylum," but not with the negative connotation of those of years gone by. 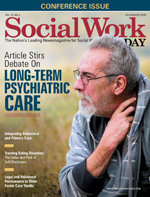 Social Work Today asked many social workers about their thoughts on this idea and most disagreed with a return to large-scale institutionalization. According to Phyllis Solomon, PhD, a professor at the University of Pennsylvania School of Social Policy & Practice, just because the community mental health system hasn't figured out a way to best treat the people with the most severe mental illness, that doesn't mean they should be isolated in institutions. And wouldn't this indeed be the kindest care?